Multi Company Purchase Order business software helps to manage your complex business activities and increase productivity of your organization. 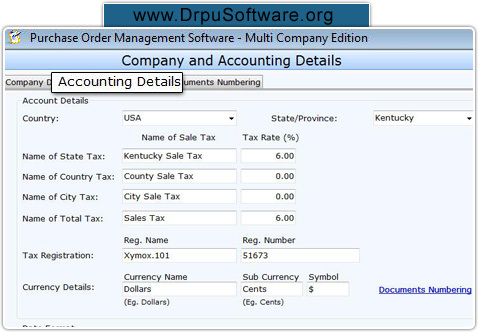 Purchase order software automates and organizes your day to day business activities. PO management program manages sales, purchase, inventory, stock, tax, customer/vendor and other records of multiple companies. Purchase order business program manages entire business transaction records and generates reports of purchase order, sales, purchase delivery, receipt, deposit and business transaction reports that can be sent at user specified email. Manages selling-purchasing records of your companies in systematic way. Maintains entire business details such as clients/ vendors’ records, item details, sales-purchase records, payments, invoice, receipts and other business information. Password protected feature provides security so that external or unauthorized users cannot access software settings. Prepares sales/purchase reports and item transaction reports to view overall business growth. Allow user to view various reports of specified date range. Provides facility to search sales/purchase records, delivery, payment records and other business records. You can export records in Excel file format. Provides backup and restore facility to get back records if data lost due to some data loss situations.